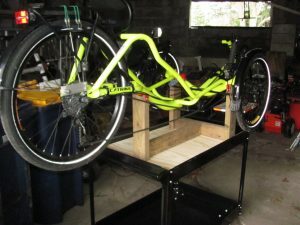 A long time ago, I built a stand to make working on my Terratrike Tour easier. It was made out of PVC pipe and fittings and is a popular design I found on the internet. It served me well for many years and when I got the Catrike Expedition, I continued to use it. The spacing between the front cradles was a little too wide, though even after I trimmed the plastic fittings a bit. You’d sit the trike on it okay, but when you went to lift it off, the stand went along with the trike because it was wedged in. I was also concerned the the PVC might begin to degrade from age or weather. It sat in my garage, so it wasn’t exposed to sun, but heat/cold/dampness was all there. 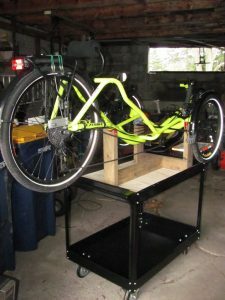 So then I saw an idea for a workstand online. It may even be a combination of two ideas, I don’t recall completely. 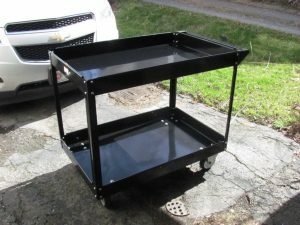 This is a Service cart that is used for the base. I got it on sale at Harbor Freight and it only took a couple hours to assemble. There are a million screws, bolts and nuts! But it is perfect for the job and I can put a toolbox below. 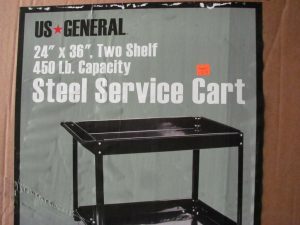 I would have liked one of the Polypropylene carts, but they are twice as expensive. Everything else is built from wood, and I had all of it on hand. The piece of plywood fit perfectly, I didn’t even have to cut it. There is about 2 inches space at the ends so I can slide it around a bit if I want, but the width was perfect. When it’s done, I might paint it or do something to seal the wood. 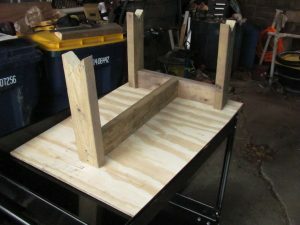 There should be plenty of room around the base for tools and parts. I should seal it before I get oil all over it! 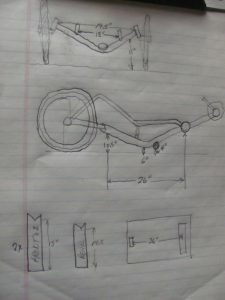 I took a lot of measurements and sketched up what I needed to make. 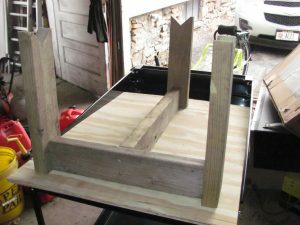 The general idea is some 2X4 pieces of wood that have a notch in the end to support the trike frame. This is what I ended up with before I fastened it down to the plywood. It is held together by 2″ construction screws which I just zipped in with a cordless drill/driver. Here it is, fully assembled and sitting in the cart. If I want to use the cart for something else, it just lifts out. One final thing left to do, and again it was an idea I read online, is to add some nylon strap in the notches to cushion the frame a bit and protect the paint. 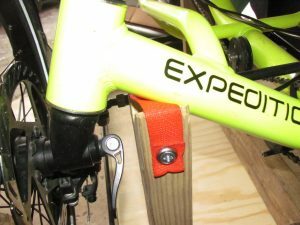 The strap adjusts to the angles of the frame tubes too. I fastened the strap pieces with finished ‘cup’ washers and #10 pan head screws. Here is the trike on the stand. Now I can put the seat back on it without bending over! Update: I’ve been using this trike stand for a while now and it is great! 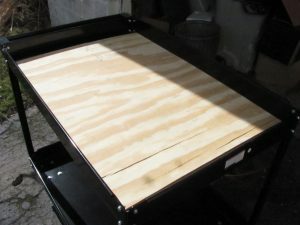 The height with it sitting on the cart is ideal and there is plenty of room for tools around the bottom. It’s filled up with parts and tools and really looks the mess, but everything I use is right there handy.